Left overs, love them or hate them- they are unavoidable. Personally, I love the challenge of finding a way to present to them so that it doesn't feel like you're eating the same meal over again. 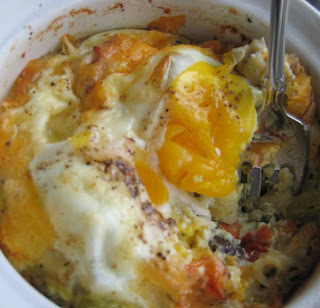 In this case, we had leftover olive pasta and I knew from the moment I got up that morning that a baked egg casserole would was calling. I am from the Midwest (Minnesota) after all; we can make a casserole out of anything! Next time you have leftover pasta -any kind of pasta will work- tomato, cream or oil based- throw this together for a super easy breakfast or a scrumptious lunch that ca n pair with a salad. 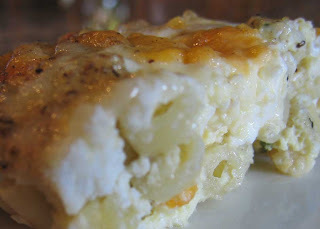 You can even make this extra healthy by using all or mostly egg whites. The sauce of your pasta will the the base flavor for your eggs, and it's gonna be great! Portion sizes are huge these days; save some for breakfast and see how early in the day you can be fat and happy! You're going to need to assess how much pasta you have- and adjust accordingly. Below is what my version- use this as your base and go from there. 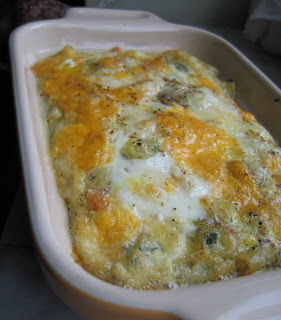 Place into preheated oven (375 degree) until the eggs are set in the middle. They will puff slightly, but don't overcook or you'll have dry eggs. Let rest for a minute and then serve.